The Stimson Scorcher was first produced in the UK in 1976. 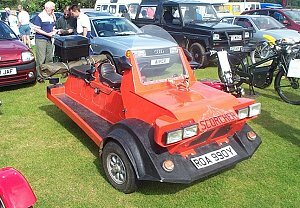 The Scorcher, designed by Barry Stimson, was powered by an Austin Mini engine and also used Mini sub frame and gearbox. The body was made from fibreglass and was in most cases completely open offering the driver no weather protection at all. The vehicle could seat 3 occupants though as it is classed as a motorcycle-sidecar combination under UK law the third person did not need to wear a crash helmet. The Scorcher was sold as a kit by Noovoh Developments in Brighton (UK) though it is believed only around 30 Scorchers were made before production ceased in 1980.